Manchester United host Manchester City on Sunday in the most hotly-anticipated clash of the Premier League season. 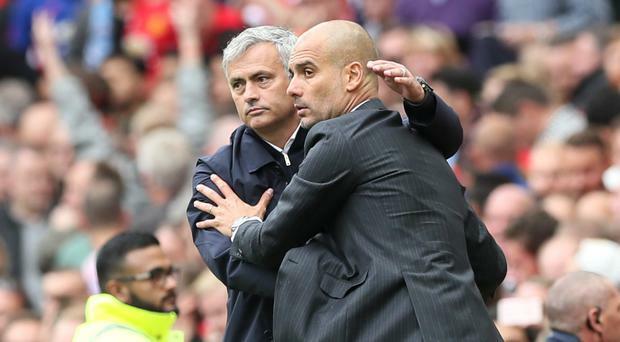 Ahead of the Manchester derby, Press Association Sport takes a look at five of the main talking points. United made it a club record-equalling 40 home games unbeaten in all competitions with the 2-1 midweek victory against CSKA Moscow, securing Champions League top spot in the process. However, taking the record outright looks a tough ask with City rolling into town without so much as a loss in the Premier League to their name. No team has ever enjoyed a better start to a top-flight campaign and Pep Guardiola's men already boast an eight-point cushion at the summit. Second-placed United cannot afford to let it get any bigger. City have been required to dig deep in recent Premier League games and came a cropper for the first time in Ukraine as Guardiola's rotated side went down 2-1 to Shakhtar Donetsk on Wednesday evening. Given they were already guaranteed top spot in their Champions League group, it had no real impact aside from the fact their cloak of invincibility fell. That will give United hope and their travel is hardly going to help preparation. Jose Mourinho is able to call upon a number of key players again on Sunday, with Marouane Fellaini possibly joining Zlatan Ibrahimovic, Phil Jones and Nemanja Matic in returning. The United boss will continue to be without Eric Bailly and captain Michael Carrick, but it is Paul Pogba's absence that leaves the biggest mark. The France international has been in exceptional form either side of his hamstring injury and kicks off a three-match domestic ban against City. The only positive for United could be his absence allowing the likes of Ander Herrera to make the midfield more solid. Herrera earned plaudits for the way he marked Eden Hazard out of the game when Chelsea lost at Old Trafford earlier in the year, and Mourinho may well deploy the Spaniard again in a bid to deal with City's swathe of attacking options. The Portuguese would be wise to look at the examples of Huddersfield, Southampton and West Ham. All three threatened to end the unbeaten domestic run of Guardiola's side recently and United look even better placed to nullify them. Negative tactics have led to scrutiny of Mourinho in recent months, but if he wins with such an approach there will not be many dissenting voices at Old Trafford. Sunday's match pits two of the Premier League's standout goalkeepers together - and both could be in for a busy afternoon. David de Gea comes into the match buoyed by a wondrous display in last weekend's win at Arsenal, where his 14 saves was the joint-most in a Premier League since such data was started to be collected in 2003-04. Opposite number Ederson, meanwhile, has been the solid presence Guardiola lacked in his first season as Claudio Bravo struggled to adapt to English football. The City goalkeeper made a mistake against Shakhtar - similar to one he made in the pre-season Manchester derby in Houston - but that should not derail him.